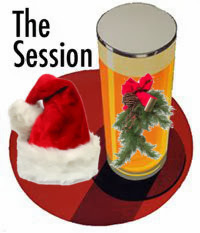 This month's The Session is hosted by Brian Yeager from Portland, Oregon. This is somewhere I've never had the pleasure of visiting but is probably the number one destination for beer pilgrims. For a city with a similar population to Dublin, they have many times our number of independent breweries. Brian asks us to design our ideal beer festival. He wants us to consider Size, Styles, Brewery Locations, Festival Location and then whatever else comes to mind. It's the first of December so therefor, it's officially Christmas. 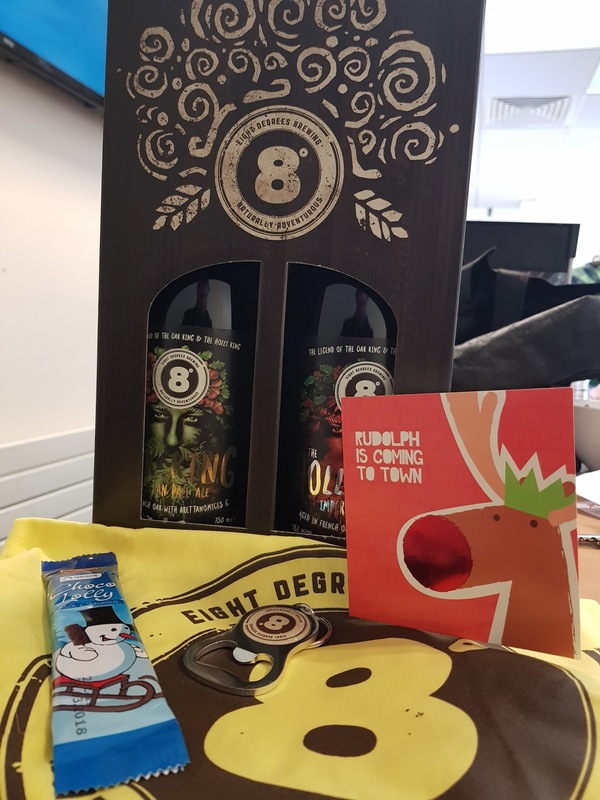 In fact, I even got my first Christmas present and card today from the fine folks at 8 Degrees. They sent me out their festival special twin pack consisting of Oak King and Holly King. Both are barrel aged, one being a Belgian Blonde, the other an Imperial Stout. I look forward to trying them. You can read more about these beers here. So moving on to the task at hand, my ideal beer festival? That's a tough one really. I've only been to beer festivals in three countries. Many in Ireland, of a multitude of sizes and styles and then one in the US which was very different. First, I want to dismiss the one I went to in Breckenridge back in 2012. This was the typical US style of pay a high entry fee but not pay for beer after. It was $30 in and I had 4 hours to get my money's worth, though it was open for 5 hours to be fair. It was pretty had to get my money's worth since every beer you wanted, you had to queue for and you only got a sample of each beer. It was a festival of queuing and there was little time to chat to the brewers about the beer because there was always 20 or 30 people behind me waiting for me to move. No, I don't enjoy this type of festival at all. I was also at a beer festival in Poland which was pretty good. In fact, I gave a talk on stage about the Irish craft beer scene. Perhaps about 15 people took notice of the talk though I'm not sure how much they understood. I did the talk with The Beer Nut and you can read a little about the festival in his article. The largest beer festivals I have been to are both based in Dublin. The RDS in September and Alltech, usually in February. They wouldn't be large by international standards with less than 50 drinks stands and about 15,000 people over the weekend. I do love these festivals but even these are a little too big for my ideal festival. What I love is the small, local festival with no more than 7-10 breweries and cider producers present. 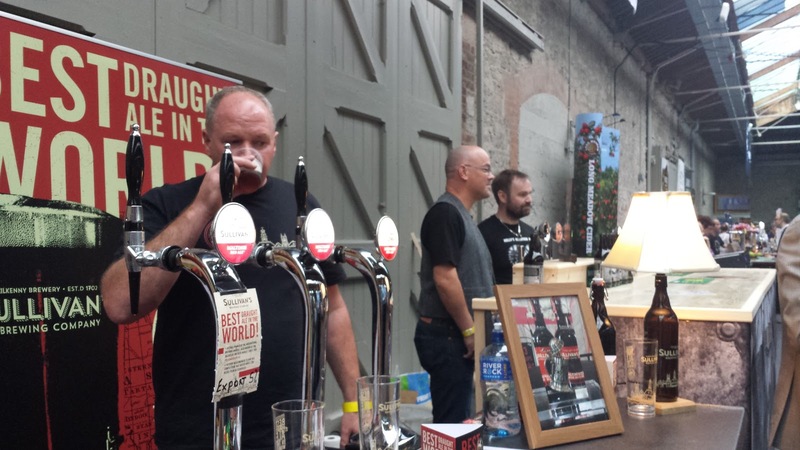 The kind of beer festival where you could easily sample everything on offer in one day. Sampling in between full measures of your favourites of course. One day, public transport there and back. My second preference is where there's 20 to 25 breweries or cider producers and you can make a weekend of it. The Killarney Beer festival is an example of that. It's usually enough time to try everything you want. Once you go bigger, you need to be far more discerning about what to pick. I've never done GBBF or anything near that size and to be honest, I'm not sure I would want to. For me, the ideal beer festival is probably one that takes place walking distance from where I live, has no more than 25 breweries and cider producers and runs for a full weekend, including Sunday. I love Sundays at beer festivals as they are more relaxed. Sure, brewers don't make as much money on the Sunday and most of the popular beer is gone but I kind of love that. It's like a long, slow, winding down of the festival with plenty of time to chat to brewers and share a pint if they don't have to drive. Sunday beer festivals should be over early, perhaps 7pm to allow breweries to get their equipment back home in a reasonable time. One bugbear of mine is loud music at a beer festival. Music has its place but not by the beer serving area as it makes conversation impossible. There also needs to be enough seating for those who wish to sit down and probably the most important is good and numerous toilet facilities. Oh and real glass ideally but if not, the hard, clear plastic glasses you get at some festivals will also work. Plastic beakers you can't see out of are terrible. That's my only real gripe with the Alltech beer festival actually. So really, my ideal beer festival is pretty similar to the ones I regularly go to in Ireland. Just make sure the toilets are up to scratch and , the glasses are made of glass and there's plenty of drinking water stations around. Oh and this is important, don't get too big!